Two weekends ago my husband and I shopped at Sam’s Club using a guest pass to get a mattress for Princess’s new big girl bed. Yes, at four years old, it is time to make the transition from crib to bed! Although we found what we needed (twin sized mattress – $199) right away, I was reminded why we do not have a membership to a warehouse store – it’s too enticing! We should have just bought the mattress and left, but I wanted to take a look around as long as we were there – we hadn’t been in Sam’s Club or any other warehouse store in five years or so. Another twin sized mattress ($199) – This one was for Little Miss Sunshine, and I will say that she really needed a new mattress – hers came with the furnished home we purchased ten years and two houses ago, and I could feel the individual coiled springs when I would sit on it. She loved this new one we bought her and said she felt like the Princess and the Pea because she was so much higher off the ground! A book for Princess ($5) – It plays a bit of the Nutcracker Suite and she used it to dance around the entire store while we shopped. Two books for me ($20) – I can’t pass up books, and they have such a nice section right in the middle of the store! I rarely get to a bookstore anymore, and it was nice to just turn the pages casually while Princess and I were browsing. Two pairs of pants and three shirts for my husband ($100) – This is where he was browsing while Princess and I were looking at books. A huge container of mangos ($7) – Who can pass up pre-cut mangos? Not me! 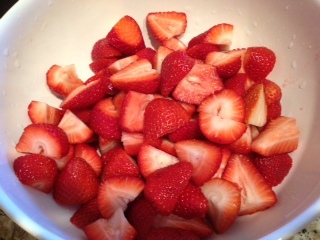 A huge container of strawberries ($4) – Princess and I had these washed, cut and eaten before the rest of the household even knew we had them. Assorted other groceries ($65!!!) – I don’t even know how these added up to that amount, but I think it was $20 of hamburger patties for an impromptu barbeque, buns, and a few frozen dinners. Yikes! So all told, our little afternoon at the warehouse store cost us a total of $600. Sigh. I will say that everything we purchased was useful. I won’t go so far as to say anything was really needed, other than the mattress, but I can say “useful” with confidence. We did pass up big screen TVs, specials on cell phones, a playground set for the backyard (so far) and assorted other toys and groceries, so that should count for something! However, after working the budget creatively to cover those purchases, I can certainly say that we can’t afford that kind of indulgence very often! I’ve chalked it up to a fun few hours at the warehouse store, which I’m OK with doing every five years or so. Has anyone been able to buy exactly what they needed and only what they needed at one of those stores?